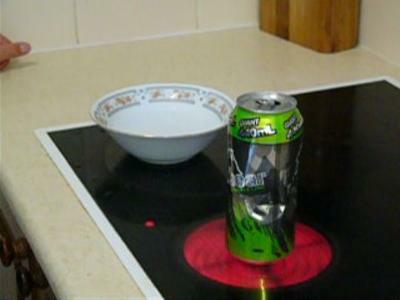 The way you do this trick is by getting an empty soda can and put in one or two table spoons of water and then put it on the stove until it starts making lots of steam. Then grab the can with some tongs and flip it into a bowl of really cold water that does not have ice. Now, watch the can crumble! You might need to do it a few times to get it right. This is one of the experiments from Supercharged Science.